Voice Organique (E): Teaser movie of Pandacchi's new album. Teaser movie of Pandacchi's new album. The teaser movie of Pandacchi's new album that I have participated was uploaded.
" 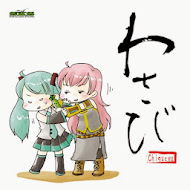 PANDA-DAISAKUSEN web site "
This is the Grand Bigband and Jazz Orchestra album that you have never listened on the albums of vocaloid. I have composed some songs in the album. Of course, I did played the guitar in all songs. Teaser movie of my new album "Wasabi" was completed!